Summer is in full swing and grilling is just about all we do. Who in their right mind wants to heat up a kitchen on a hot summer day. We have been grilling this 5 star Grilled Cedar plank Salmon for years and it is the best salmon in the world! Well as far as my family is concerned anyway. 🙂 You can find the cedar planks at Walmart in the seasonal grilling section. Ask at any local store they should carry them pretty much anywhere. Make sure and stick around and check out all of our Easy Dinner Recipes here on our blog! We got together for the Fourth of July and I was having a hankering for the grilled cedar plank salmon. Corn on the cob, asparagus, deviled eggs and Pretzel Fooler were the perfect foods to have for a light refreshing dinner with family and friends. We had a wonderful time grilling out and watching the fireworks. We were unsure if Charlee Ann would like the fireworks or not. She is 3 now and that can be such an iffy age when it comes to loud noises and bright lights. There were a few that she covered her ears on and she got a little ansty at the end but all in all she had a great time at the display. Soak cedar planks fully submerged in water for at least 2 hours. Combine equal amounts of Dijon mustard and light brown sugar in a bowl. We used 1/2 cup of each but it just depends on the amount of salmon that you are going to grill. Leaving the skin on the salmon. Skin side down place on the wet cedar plank. Spread the sugar/mustard mixture on the top and sides of salmon. Place cedar planks directly on the hot grill. Cook on medium heat with the lid closed until fish flakes apart. Do not over cook. The salmon needs to register 145 degrees (according to USDA recommended internal temp.) We did take the smaller thin pieces of before the thicker slices. What have you been grilling this year?? Salmon is one of our favorite recipes in the summer. We are definitely going to have to give this one a try. Salmon is perfect in the summer. What a great recipe! I’m loving the cedar plank method of cooking these. Everything sounds incredibly delicious! This sounds so yummy! I just had some bbq salmon this weekend. 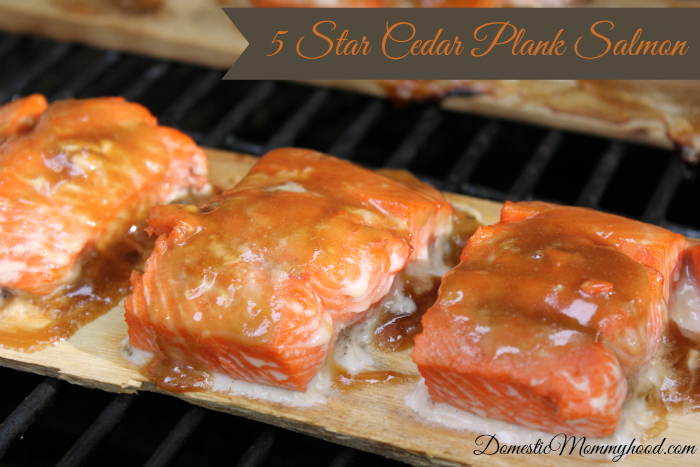 I have been wanting to make cedar plank salmon for ages. I just keep forgetting to buy the planks! I can not eat salmon but my hubs loves it.This is a great idea.We have been eating a lot of steak lately. Yum, I love salmon! Totally going to try this recipe! Fantastic way to grill salmon. Looks so tasty. Ohh, yummy! I love salmon but we honestly never fix it at home much. It’s not because we don’t want to…we just really never found a rub or recipe that we liked. We’ll have to give yours a try! Salmon is my favorite, but I’ve never tried it with dijon before. Thanks for the tips! This made my mouth water! It looks beyond delicious. I love Salmon, especially in the Summer time. My husband loves salmon. I’ll have to share this recipe with him for grilling. Oh that looks so delicious. I have not grilled much this summer. OMG this looks delicious! We are going to give grilling salmon a try. Thanks for the info! My husband loves grilled salmon! I am not sure if he has made them on cedar planks, but I know he would love this recipe! Oh my gosh, I love salmon. I’m drooling. Oh my yumminess! I clearly need to be less boring with my salmon and may have to give this a try! That salmon looks delish! We try to eat fish twice a week so this would hit the spot. Thanks for sharing the recipe! I’ve never make salmon on a plank before. I’ve always wanted to try it, though, and this recipe looks fantastic! I love making salmon and am always looking for new ways to bake it. Thanks for sharing this easy recipe! I love using a cedar plank to grill. It’s great with fish and even chicken! You had me at salmon…. we love plank grilling and have a few at home calling this recipes’s name! Thanks for sharing! Pinned this, it looks amazing, and I’ve been in the mood for a good salmon dinner lately! We have two huge salmon lovers in the family. I am filing this away for later use. I would have never thought about grilling on a cedar plank! Looks delish! I am always worried about undercooking fish. That is kinda weird seeing as I love sushi:) Thank you for the simple recipe! I love Salmon! Although I’ve never tried cooking it this way so I can’t wait to try. Oh that looks yummy, Salmon is my favorite!! I never tried it with dijon mustard though. I love salmon on cedar planks. I think salmon really absorbs the flavor of the cedar giving it a sweet taste to the fish! Ooo, delicious! Great job on this. Salmon is my favorite fish, and one of the only ones I eat. Cedar plank is an awesome way to cook fish! And salmon is the best, it is one of my favorite fishes! Living at the ocean, fresh fish is the only way to eat! We love grilling salmon on cedar planks. We could easily eat that several times a week. Pinned this! Can’t wait to try this yummy recipe! That sounds delicious and super easy to make. We’ll be making this soon for sure. I use cedar on my grill with great success. I will try this technique. I just bought some new cedar planks but have not used them yet. Thanks for posting this and reminding me to use them. They look delicious! I love, love salmon! Again, thanks for coming and linking up at The Weekend Social Party.